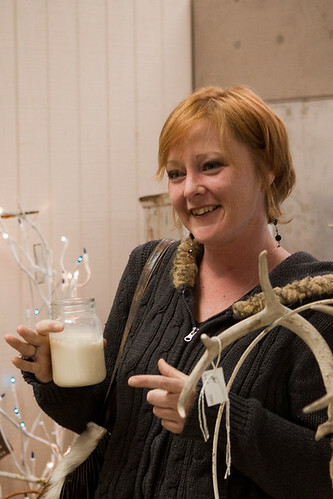 Yes, that's Robelyn drinking Pennsylvania Dutch egg nog out of a mason jar. You know she's a redneck, right? I have just got to share some of Robelyn's latest creations. 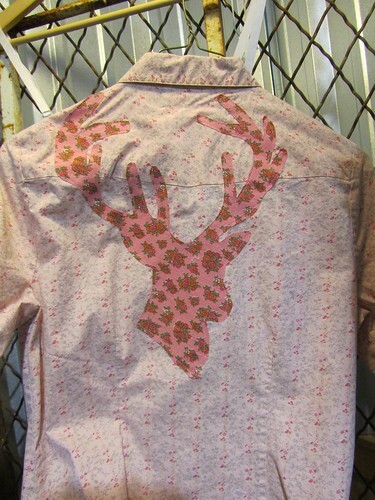 This buck shirt is for girls. Don't you love it? Saddle Tramp a division of redneck chic. 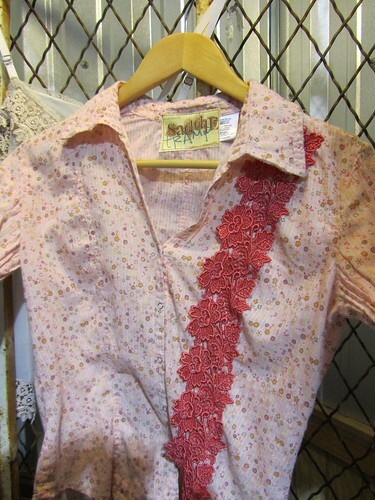 Who wouldn't love this pink shirt under the Christmas tree? Is that a potholder? I'm not sure. But, this could be my favorite shirt. The Primitique has been chosen by the executive director of redneck chic as one of the privileged shops to sell the Saddle Tramp line. Can you say exclusive to the Dallas area? That's us! I do love the dove. Oh! 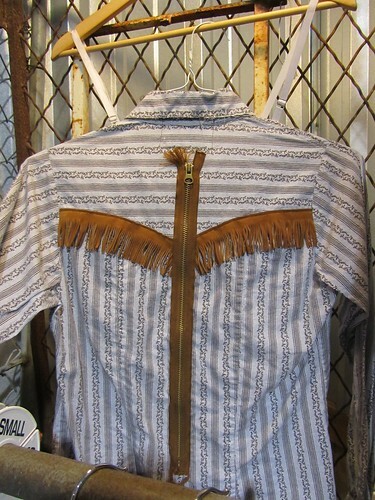 This zipper/fringe shirt could be my favorite! 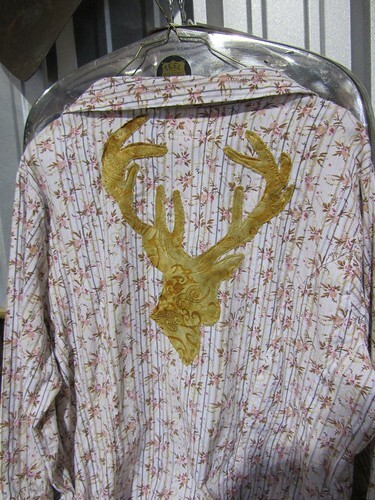 Love this buck and the fabric! We are carrying girls sizes up to women sizes. Two of the shirts you just saw are 22/24. If you have a special size request, please let us know. 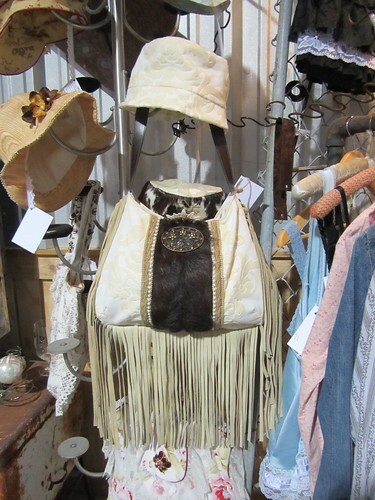 You know we cannot discuss redneck chic without showing off a pocketbook. This one happens to have a matching hat. Yes. It's available at The P. You better hurry! There she is. The redneck. Head seamstress. Creative genius. Executive director. My friend, Robelyn. By the way, I'm going to play with the red head this weekend on her stomping grounds. 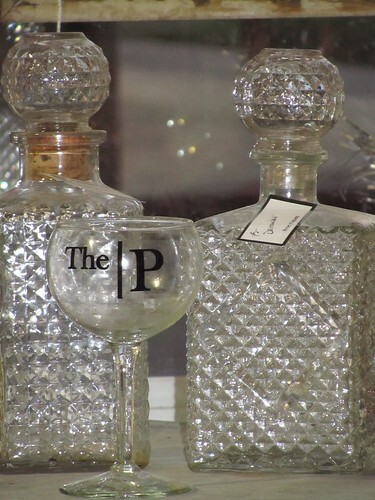 We'll be drinking our egg nog out of The P stemware, cuz it makes us feel fancy. And yes. We'll be talking about you! ps. The Primitique is less than an hour from Canton. How convenient? We're open Monday-Saturday 8a-6p. Hi! I was the one who won the hat/purse combo that Robelyn made for her vote giveaway, and I LOOOOOOOOVE them!!! I want to wear them everywhere--seriously! How talented and gorgeous she is!!! 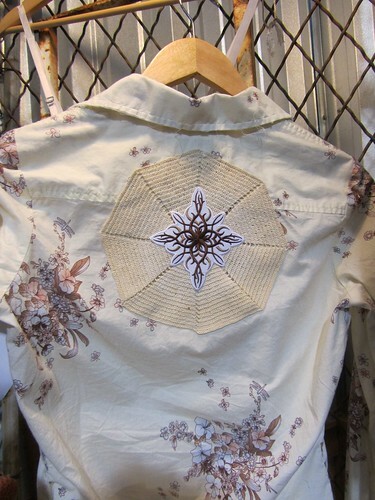 What I failed to share is that there are fun embellishments on the front of the shirt, as well! 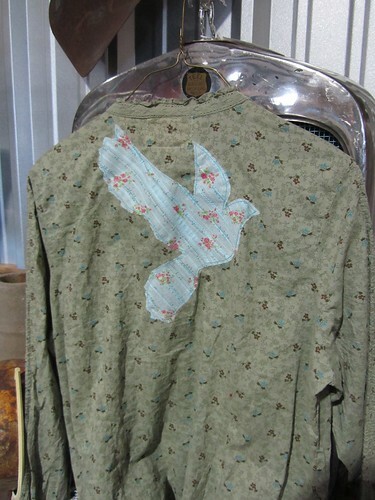 Debra, the front of that green shirt has a dove on it, as well. Love it! I need one or all of those shirts! She is crazy talented isn't she? Hmmmmm...what can't that sewin' genius do? AND she's a super cutie! I know you two must be havin' tons of fun! I know y'all caught her talking duct tape in that first photo 'cause her hands are talkin' too! Give her a hug and a squeeze from me would you...and take one for yourself while you're at it! P.S. How much bail money do you think I should set aside for the weekend...just in case? Oh thats to bad bout you old bats! lol! But anyway! That redhead is the cutest thing I've ever seen! And I'm happy to announce I am the proud owner of one of her pocketbooks! Those shirts are adorable! The zipper one is my fav.! LOVE her creations...I want one!!! Robelyn is the Albert Einstein of fashion - an absolute GENIUS! Love the 'redneck', to pieces! And not just because she lives close to Gatesville (my birthplace). 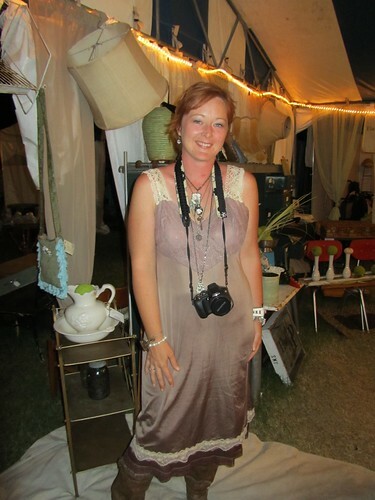 She is super creative, and a great bloggy friend too! Love that fringed bag, and all the shirts. Hope you're selling out of everything, Mindy!! yes i love it! i LOVE IT ALL! and that red.neck gurl is BRILLIANT and adorable too! yep! she's super talented...I think I need to get one of her fabulous shirts to go with my redneck purse. hope yall get to feelin better soon! Love the shirts Mindy, she is talented! Will you still share your eggnog with me? 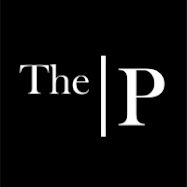 I'm PROUD to have these things in "The P"!!! I get all grinny when I think about your shop. That's some fain-cy stemware you girls got. Enjoy your eggnog! Love the new clothing line.